Anguilla Guide to Events in December: Christmas, New Year's Eve, and A Month of Celebs! Christmas, New Year's Eve, and A Month of Celebs! It's that time again in Anguilla... The time when everybody who works in Anguilla is "chasing their tail." December is the island's busiest month. It all starts off slow. The first couple of weeks of December are quiet, as steady preparation builds in anticipation of the last two weeks of the month. 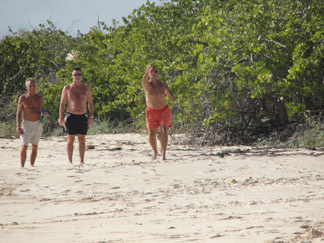 If you are looking for the best off-season time to visit Anguilla, early December is it! 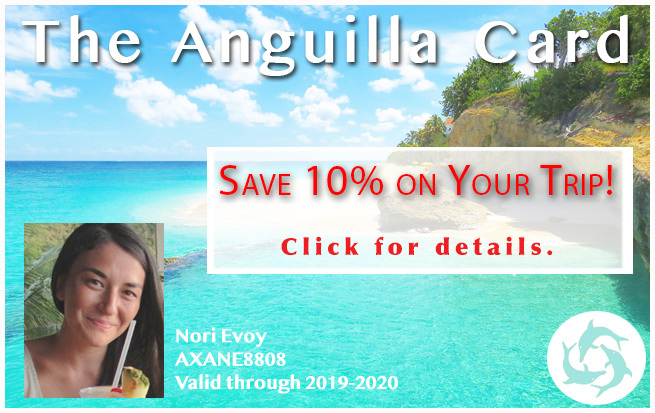 The Anguilla weather is perfect (no hot, sticky days, although the sea can be choppier), rates on Anguilla hotels and resorts are off-season rates, all of the Anguilla restaurants are open... And, you beat the crowds! It's bumper-to-bumper at the Anguilla airport. 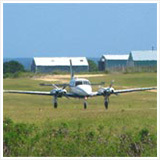 Private jets are all lined up as celebrities and other high rollers flock to the island. Last year, we even spotted Michael Jordan's jet in Anguilla, and saw him dining with Derek Jeter later that week! Remember... In December, keep your eyes peeled extra wide for celebrities! Rates on Anguilla accommodations go up this time of year, and you will need reservations for most of the top restaurants. For example, SandBar is extremely popular, and becomes crowded in the high season of December. Reservations recommended! An Anguilla guide to December tip? 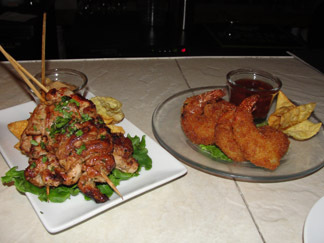 Tip: Plan for an early dinner at SandBar! The best reward? 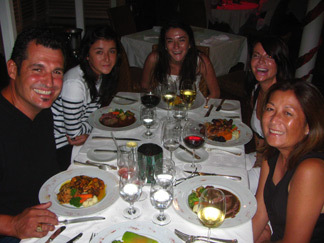 Bottom line for dining in Anguilla in December? Call ahead or arrive early! So, Why Should You Visit In December? While the snow is coming down hard up North, Anguilla weather in December is idyllic... Not too hot, never cold. 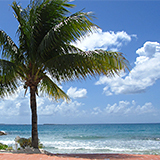 Click here to read about December Anguilla weather. The beaches also become more active in December. Groups gather, and games ensue. Shoal Bay and Sandy Ground are the best beaches for games! Elvis' has a Volleyball court. There are usually plenty of people around to build teams with! Many hotels and restaurants offer live music. 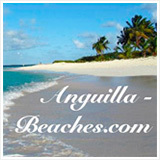 Click here to keep up to date with weekly Anguilla events. Head First Off The Little Bay Rock! Skip the umbrella and chair-lined beaches, and check out secluded Little Bay. Jump off the rock at Little Bay. Note to Little Bay Lovers: Be advised that in December, you may run in to a few more anchored boats in the area but there is still room for everyone! 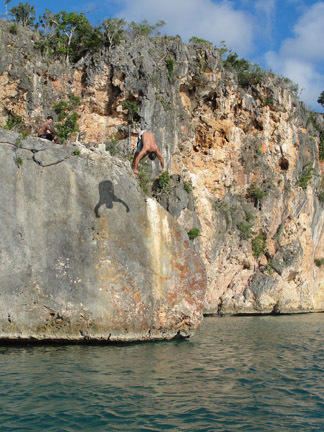 When the Anguilla episode of The Bachelor aired, it showed the actual bachelor and his date jumping off the rock. 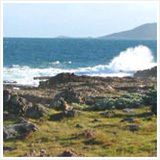 If you have an adventurous side, Little Bay is the place for you. 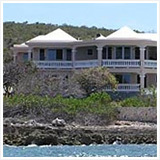 Tip: To get to Little Bay, drive to Crocus Bay and look for Calvin. 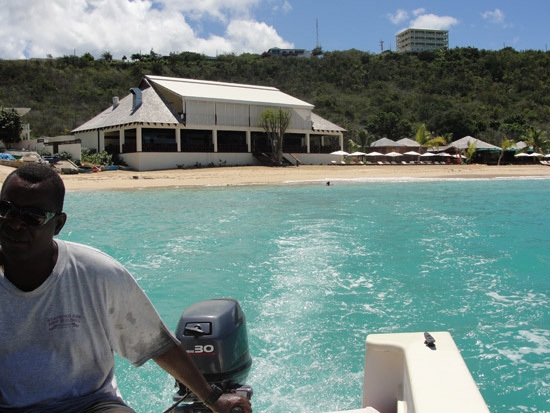 He offers round trip boat rides to and from Little Bay (from Crocus Bay) for $15 per person. Just set a time with him, and he will come back to pick you up. 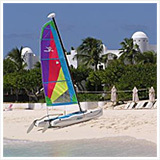 Build your Little Bay day around lunch at Da'Vida Anguilla to really make the most of it. 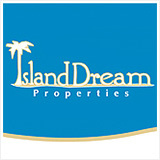 Click here to read more about ever-exotic Little Bay. Right before high-season kicks off, the Anguilla Chamber of Commerce and Industry usually holds their annual golf tournament, "Around Anguilla in '18' Holes." The tournament is a 4-person scramble. You can also choose to enter your own team of 4 or be assigned a team. There is a $200 entry fee per player. This includes the green fee, coffee and tea, your golf cart and a post-tournament lunch and cocktail hour held inside CuisinArt's lofty Club House. It all begins at 9:30am with the award ceremony. All funds go towards ACOCI's scholarship fund. An excellent cause! For more information, visit ACOCI Golf Tournament. The Christmas spirit is alive and well in Anguilla. The Christmas season is always jam packed with so many community events. It all starts around mid-December. Fun competitions, pageants and various Christmas traditions with food and stories take place in communities around the island. As for lights? The Anguilla Christmas lights are beautiful! Some Anguillians really get into the holiday spirit and go all out with their Christmas ornaments. There is also always a Christmas tree lighting in The Valley. Some years, the community even organizes Anguilla's "Christmas Village." 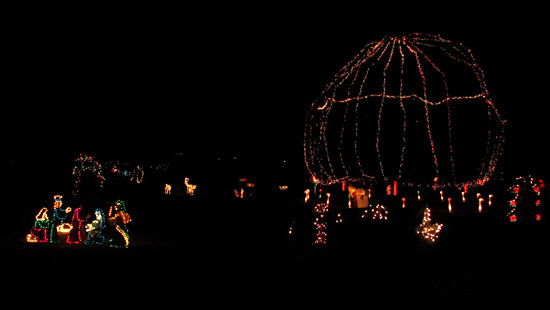 The Christmas Village is a collection of Christmas decorations and Christmas lights. It is magical! The Christmas Village (on years it is operational) is located in the Lower Valley, on the first paved road turn off to the right, after coming from the Valley round-about. If you are celebrating Christmas in Anguilla, also note that there are many Anguilla restaurants serving tasty Christmas dinners. My Mom loves cooking a big Christmas dinner. So, we don't normally dine out on Christmas Day. But, back in 2008 when we first moved to Anguilla, we didn't have a kitchen for Christmas cooking. We celebrated that evening with our good friends Mike and Joanna at Koal Keel. What a special (and delicious) Christmas celebration it was! 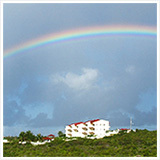 Many people love celebrating Christmas in Anguilla. Click here to read a story by Beth from Ohio about her Christmas friends in Anguilla, and a special Christmas tradition. On Christmas night, many people end their evenings with a visit to Elvis' or Pumphouse. 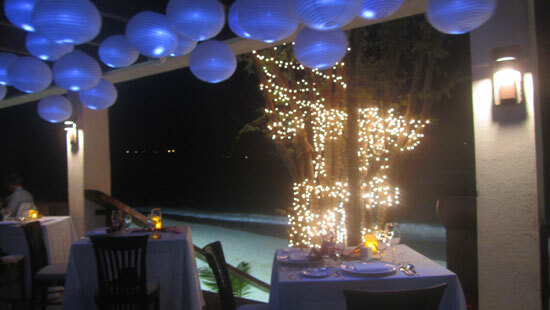 Many Anguilla restaurants and bars hold special festivities on New Year's Eve. But, in Anguilla, they don't call it New Year's Eve! They call is "Old Year's Night!" Our #1 New Year's Eve spot? daVida! 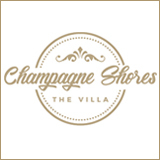 It is a classic New Year's Eve celebration... From the five-course five-star meal, to the complimentary Venetian masks, to the decorations, live music and atmosphere... There is no better place than daVida to ring in the new year. 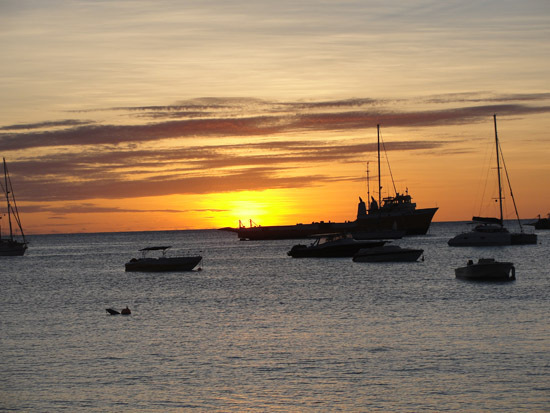 Click here to read about our Anguilla NYE celebration at daVida. Many people choose a restaurant to ring in the New Year, then head down to Elvis' or Pumphouse for more celebrating (until about 3am or so). The party doesn't stop there! Bankie Banx holds a New Year's Eve Morning celebration on the beach, with champagne and breakfast, which lasts until 5, 7 or even 10am. Click here to read more about NYE in Anguilla. Stay tuned for more information on New Year's Eve celebrations this year. After Christmas, New Year's Eve, and all of the partying and celebrating... What next? Perfect the art of doing nothing at all, just "liming"... Sink your heels into the white powder beach, rum-punch in hand! 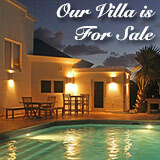 To read more about celebrities in Anguilla in December, click here.